After exploring a billion pagodas at Bagan, we were ready to try something a little different. We headed to Inle Lake! 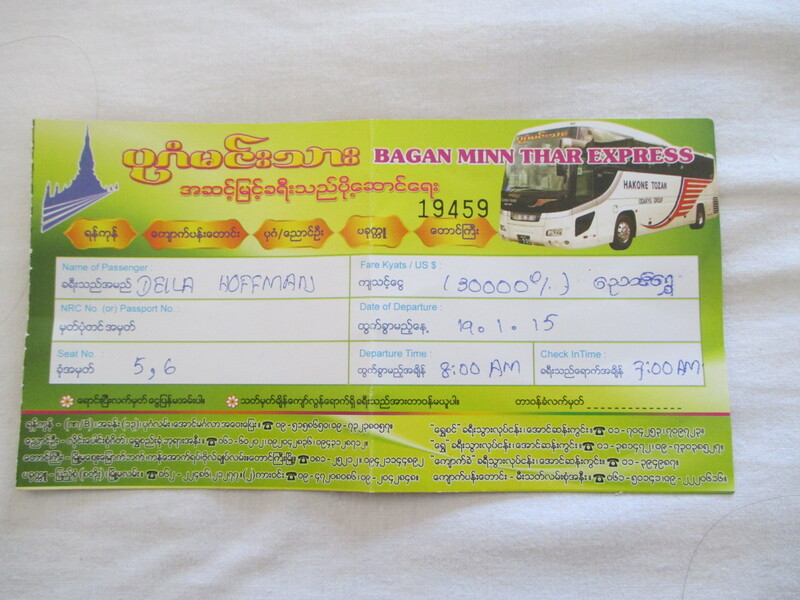 We booked a bus to Inle Lake through our hostel in Bagan. They sold us a ticket, assigned us seats, and then told us the bus would pick us up at 7:00 am. We had dealt with a few other early pickups (ah the joys of dorm living) and so knew the drill. It seemed as if minibuses picked people up and whisked them away almost every morning. We were content, feeling like everything would be easy. Our first inkling that something was a little weird was when a roommate from our dorm came in explaining that she was doing the exact same trip the following morning. She had a different colored ticket, and her shuttle was coming to pick her up at 7:30 am. So after comparing our tickets and departure time, we just figured we’d all go with what we had been told. Secretly, we thought she must have misunderstood and was going to get left. We caught our shuttle the following morning with several other people from our hostel and we were off! We were crammed in the back and we saw that we were clearly picking other people up, though there seemed to be some confusion about where. We went to another hotel in New Bagan (the town where we were staying) but no one showed up. So, we drove all the way toward Nyuang U (30 min away and where we thought were going to catch the main bus). We went to another hotel and no one showed up… So the minibus promptly turned around and headed all the way back to New Bagan where we went to another hotel and did finally pick up another couple. By this point it was about 7:45. We saw on our ticket that pickup had been at 7 am but the bus departure time was at 8. We were starting to worry about making the bus. Our minibus headed back toward Nyuang U again! We stopped and picked up another couple. By this point, it is 8 and we are really concerned about making the bus! All of us in the minibus discuss and assume that our drivers have to be in communication with the bus and that it will wait. Then we toodle to a final place where we pick up a final person. We now have a completely full mini bus with 12 people crammed in. We figure we must be ready to head for the bus! We arrive in a dusty parking lot where we see a couple of large buses, so as soon as our driver stops, we all start to tumble out of the minibus. Our driver runs back and gestures no no to get back on the bus! Finally, we were able to communicate a little that the small minibus was indeed the bus we were to take the 8 hours to Inle Lake. This is where the dread set in for us… We had been ushered into the very back in the corner. It was hot and stuffy back there and we could hardly move as our knees were shoved into the seats in front of us. And that’s how we rode…. all the way. Ugh. There were 12 people crammed in here! Luckily, when we did finally arrive in Inle, the minibus dropped us off directly at our new accommodations and by some great luck, we were the first ones off! Phew! Remember Inn – We had picked this place based on a recommendation by another traveler and from the Lonely Planet. We had also found it on agoda.com. We booked one night using that site as we kept hearing how everywhere would be full, but we were unhappy because we felt like were paying way more than we should. Luckily, when we arrived they said that if we wanted to stay extra days and pay for those in cash, we would get the more normal rate of $25. We were happy enough as our room was quite large. Though, there were some ants in the room and the Wi-Fi was extremely slow and only sometimes would let us connect (and only from near reception, not up in the room). This made it difficult when we were trying to book our accommodation in our next stop, Yangon. The best part of our stay here was the included breakfast. It was served on the roof top with nice views of the surrounding area, and it included a menu where you could choose a variety of things. 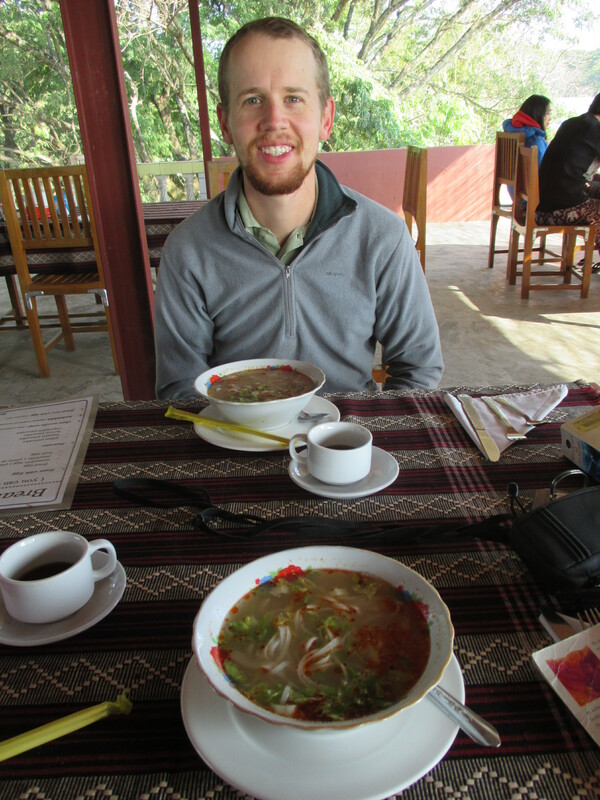 There were western style options like eggs and pancakes, but also two delicious local options, a Shan Noodle Soup (which Della had every day) and a Mohinga (a traditional fish soup breakfast here in Myanmar). 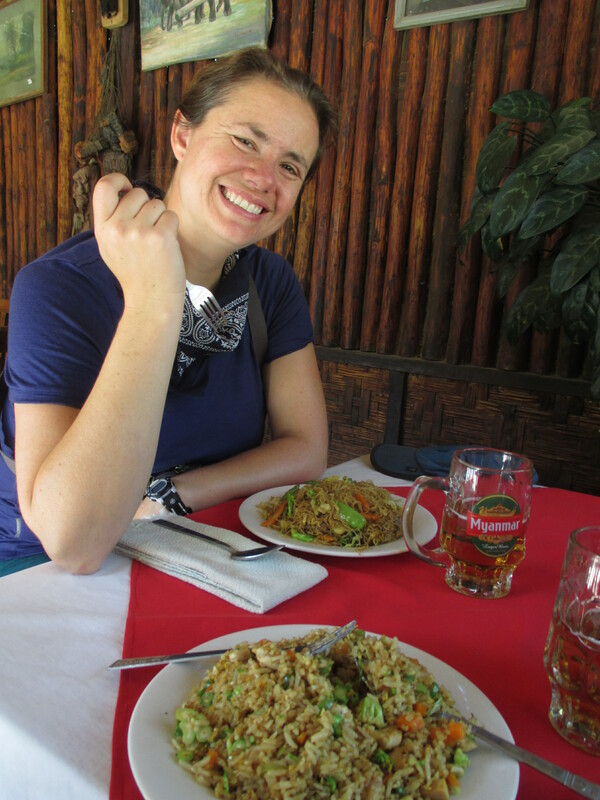 Bike to the Red Mountain Winery – On our first full day in Inle, we rented bikes and headed out of town toward a winery! The Red Mountain Winery is about 5 miles outside of Nyuang Shwe (the main town for Inle which we were staying in). It was a glorious day and we really enjoyed the ride. It was quite a push up the hill to get to the winery, but it was so worth it. You can get a taste of 4 wines for about $2. The wine was OK though not fabulous. We each found one we liked well enough to enjoy a glass of while we nibbled on an appetizer and took in the view. We waited around for the free tour and ended up being the only 2 on it for a little while. It was a short tour and we learned how the winery is quite new, imports most of its plants from France, and has mostly broken machines so they do things like label by hand. We also ended up eating lunch there. The food was pricey (by Myanmar standards) but good and the view was hard to beat. The Aung Traditional Puppet Show – We were excited because we got to meet up with some new friends from Mandalay again in Inle. We met them (and another couple from Switzerland that they also knew) for the traditional puppet show. The show was only 30 min but was thoroughly enjoyable. It was run by one man and his son. They have been in the puppet business for years (the man showed us a picture of his grandfather doing the same). It was quite amazing to watch the intricate movements the puppets made and to see some of the puppeteering action. The man was dancing as much as his puppets were! We definitely enjoyed this and recommend it! Boat Tour of Inle Lake – We organized through our hotel for a boat trip on the lake. We asked then to pair us up with some other travelers to share the cost, plus it is always nice to meet new people as well. The 5 of us met our boat driver at 8 am and headed to the water. We entered a long, sort-of canoe like boat. Our driver make sure we each had a wooden chair with a cushion, a life jacket, and a blanket. We then headed out down the canal! Watching the life on the water was just amazing. It was a major thoroughfare and we saw tourist boats along with boats transporting produce and many other goods. After stopping for quick gas up, we make our way out onto the big part of the lake where we got to observe the fisherman rowing their boats in the traditional fashion, using their leg to move the oar. We rode all the way down to the far south end of the lake and then through a village floating on the water. It was interesting to see how the people who lived in these houses used the water as a kitchen sink, washing machine and shower. Past the village we found the floating market. The market rotates around to different locations. We understand that there are 5 locations. The day we went, it was near Thaung Thut. We didn’t shop much, but we were very happy to find a bathroom after a few hours on the boat. Luckily, if you keep walking through the market and up the hill, you end up at a fabulous pagoda. We enjoyed the views at the top before heading back down! We hopped back on the boat and drove back through the floating village and then to a place that did traditional hand weaving. None of us was interested in buying anything, but felt pressured to get out. Watching the weavers at work was actually quite fascinating, as they use these old machines with hand cranks and foot pedals. After this we paused for lunch at a restaurant over the lake. After that, we headed to the big event: Indein. We had heard that this was best stop on the whole lake. To get there we drove upstream on a river – even up over a few waterfalls! Once at the village, we spent time walking through the very long tourist market, through some old pagoda ruins, and up to a beautiful pagoda at the top. It was quite lovely but we weren’t sure if it was that much better than the pagoda at Thaung Thut. Back on the boat, we rode through the floating gardens, where it was fascinating to see how produce is grown and cared for in the middle of the lake. Our final stop was the Npa Hpe Kyaung Monastery, also known as the Jumping Cat Monastery because a monk once trained cats to jump through hoops on command! But that monk died and the tradition died with him. So now the main thing to see is the large wooden hall with many different Buddha images. There was a large clowder of cats that we watched for a while, but none of them ever jumped through hoops. Explore the Market and Town – On our final day in Inle, we checked out of our hotel but had several hours to kill before our overnight bus for Yangon left. We decided to go out and stroll around the market and town. The market was great, with almost everything you can imagine. It was bustling with people, mostly locals. There were tons of fruits, vegetables, meats, fish, and clothes. Of course there was the occasional tourist trinket booth as well! Della was particularly excited because she found a seamstress in the market. After buying some “banana pants” (this is not a real term at all… just what Eric calls them) the day before, she had been disappointed when the elastic in one leg broke immediately. It was awesome though, because for $0.50 the woman in the market fixed the elastic, re-hemmed the leg, and did some additional strengthening of all the seams! The pants are now fixed and even fit better! On the rest of our wanderings through town we also found the old sports field and slightly dilapidated independence monument. We’ve already mentioned two of the places: lunch at the winery and lunch on our boat tour. 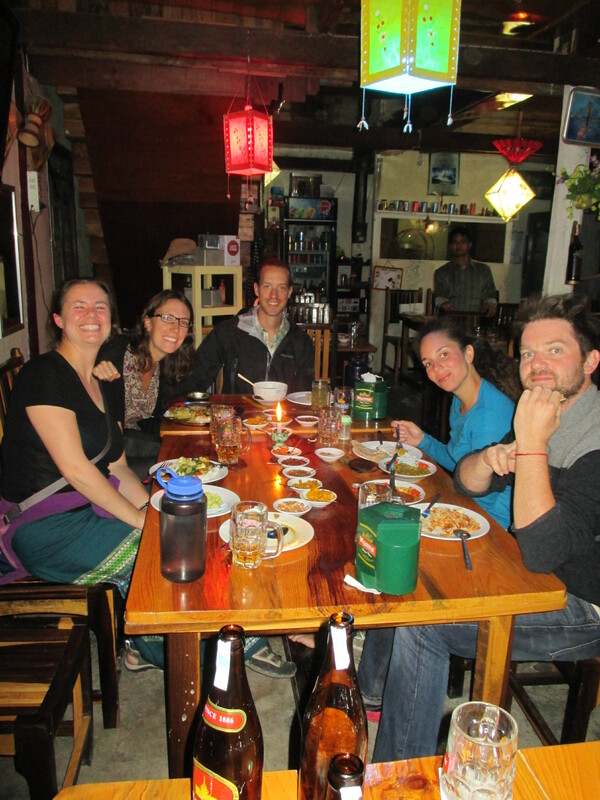 We did also eat out in Nyaung Shwe two nights. Our first night in town we ate at the Lotus Restaurant, which had been recommended by Lonely Planet. Eric’s meal here was a little bit different in that it was a multi-course set meal which came with a soup (with maybe some pumpkin in it), a tomato and cucumber salad, and a pork and potato curry. He also got a fruit plate for dessert to share. Della went with her standard noodle plate. The night we went with our friends to the puppet show, they suggested going to a Nepali place. We had already eaten some snacks so we just shared two small plates: fried vegetables and avocado salad (which turned out to be more like guacamole). Nice dinner with new friends! The last day, we ate lunch at the Unique Superb Foodhouse (yes, that was really the name!) Della stuck with her delicious friends vermicelli and Eric tried fried rice. Inle Lake was a great place to visit with a lot of things to do in the surrounding area. The lake had a great laid-back vibe that we really enjoyed. The town of Nyuang Shwe was hectic, but enjoyable, but it was easy to get out on to the lake or up to the winery for some instant relaxation. Boy, do I wish I had been there. Nice jelfie at “halfway up”. Glad you bought some clothes and had them repaired. Ours just fell apart.